Charles Darwin University presented the Ronny Reinhard Memorial Prize for Creative Arts at the recent Alice Springs campus prize-giving ceremony, which recognised the achievements of local vocational and higher education students. Mr Reinhard fought a brave battle with cancer and passed away last year. Many of his students have won national awards for their work and have moved into careers in the screen media industry. 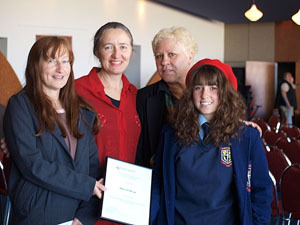 Student Merrill Bray won the inaugural award, which was presented by Ronny’s daughter, Lucinda, and widow, Leonie. The winner was announced by the Director of NT Film Office, Penelope McDonald, who spoke about Ronny’s contributions. “His enthusiasm, good humour and natural charm were infectious and Ronny’s legacy remains through his work as a gifted teacher working with young people and adults in Alice Springs,” she said. Associate Professor Bill Wade, Head of the School of Creative Arts and Humanities paid tribute to Ronny. “He had a gifted and unique way of connecting to students, inspiring them to reach for their best and this annual award will ensure ongoing recognition of excellence in the creative arts,” he said. Recipient Merrill Bray said she was honoured to receive the award. Merrill's film Unspeakable was the last film Ronny worked on. “I feel so honoured to have known Ronny, who was a brilliant teacher,” she said. Merril has been accepted into the Australian Film and Television School in Sydney and said Ronny’s teaching helped her to win a place at the highly competitive school. “I look forward to coming back next year, producing a film and dedicating it to him,” she said. Central Australians flocked to Ronny’s annual ApeTV Golden Gorillas awards which showcased his students’ films and, for a lucky few, earned them the namesake statue. His daughter, Lucinda, said she would follow a similar path to her father. “Dad influenced the lives of many people and I’m keen to follow in his footsteps in the creative arts,” she said. More than 100 people filled CDU’s Desert Lantern Restaurant where scholarships and awards were presented to higher education and vocational education students. “We greatly appreciated the contributions of local sponsors and attendance by Alice Springs Mayor Damian Ryan and CDU Vice-Chancellor Professor Barney Glover to this important event,” he said.